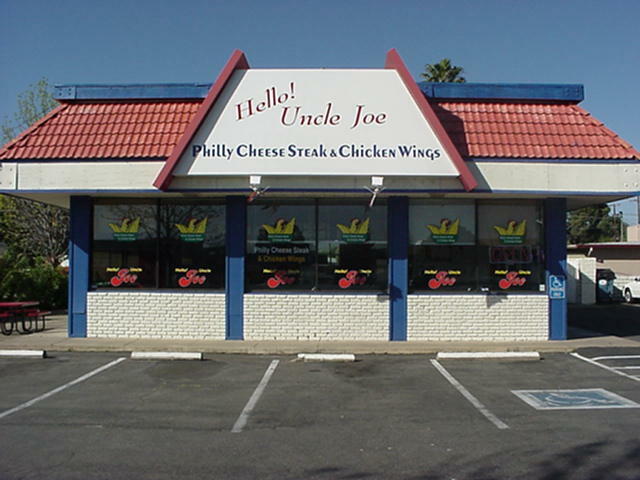 Hello Uncle Joe is one of thousands of family owned and run little restaurants that serve a variety of lunch and dinner fast foods. While Hello Uncle Joe serves hamburgers, they specialize in Buffalo chicken wings and sub-sandwiches. They also dish out salads, hot dogs, and nachos. The service in this converted Dairy Queen was fast and friendly. The bathroom entrance was located outside which was a blessing. Since I have to spend many hours with Dr. Meat conducting our reviews, I have noticed that he frequents almost every restroom. There have been several occasions when we have had to dine outside after one of his infamous toxic toilet visits. The Burger Guys love small, independent restaurants like this. They have the ability and opportunity to break away from New York corporate directions. They can step out of that path most traveled and establish an image with their own personal flair. These are facilities where the owner acts as chef, greeter, bus boy, and broom sweep. The owner has a vested, personal interest, and his self-esteem should rise and fall with the quality and success of the restaurant. This is the theory, but the reality is that most of these restaurants are mediocre, and Hello Uncle Joe falls into this category. The fried patty in their cheeseburger is what is typically found at a junior high school cafeteria. It is frozen, thin, dry and unseasoned. It is covered with a slice of processed American cheese, two fist-fulls or shredded iceberg lettuce, and dollops of catsup, mustard and mayo. The bun, however, was excellent, fresh baked and chewy. Combined with the meat and condiments, this tasted like a lettuce and mustard sandwich. The fries are the standard frozen white sticks we find at most mediocre hamburger restaurants. They were unsalted, skinless and tasted like hot steam. They could only be eaten with twenty shakes of salt and a bucket full of catsup. Potato chips, sold at the counter, would have been a better option. Hello Uncle Joe hopefully has better Wings and Subs. If not, their tenure on East Bidwell will be short lived. In a moment of spontaneity I went into a little establishment in Folsom called Hello Joes on East Bidwell. It bills itself as a Philly Cheesesteak sandwich place that has world famous Buffalo Wings. Once inside I perused the menu and noticed a wonderful selection of the afore mentioned sandwiches, but what really caught my eye was the selection of burgers! I thought to myself I found a goldmine. My guests ordered the sandwiches and the wings and I took the "single with cheese" plunge. Although my guests were pleasantly surprised with the amount of the food they received and pleased with the overall presentation, I had a bit of a quandary. My burger arrived with a homemade or at least a high end bakery type bun, and a side of frozen fried potatoes. The fries were very hot but they had no taste, they tasted like oil, no they were more like lotion. Reminiscent of sweat ladened suntan lotion dripping from your forehead into your mouth. I ate two of them and gave the rest to my mice in my classroom. They were very pleased. On the other hand the burger arrived looking all hot and special. As I said the bun was something to behold (and hold). Now I'm not into buns as much as my partner ( he should be called Professor Buns, he can spot good ones a mile away), but as an amateur baker I can appreciate fresh bread. The sauces were yellow mustard, a little mayo, and a splash of catsup. The lettuce was whole leaf, the pickles were the usual, and there was a little chopped onion. The patty was smallish for a quarter pounder, it was dry and crumbly like a Gaines-burger. A small taste of the meat only was bland , but it finished rather foul. I had a childhood flashback of the frost that was in my parent's freezer, as a child of 15 or 16 I thought that frost was snow, when I ate a pile of the frost and became quite nauseous. Needless to say I could not finish the burger. I don't know what discount warehouse they purchase their meat from, but they need to stop the order. When it comes to Hello Joes, come for the Philly Cheesesteak and stay for the Wings.